WHAT WE FILIPINOS SHOULD KNOW: To think about the Filipino predicament is to be overwhelmed. The causes/roots and effects of existing societal problems in our homeland are so enormous that it is much easier to ignore and/or get away from them, i.e. emigrate out of the country if possible. We all know that we individually already did, may be able or have the capacity to do so, but how about the multitude who can not? We as humans, especially we Filipinos, tend to act only if we ourselves are directly affected. 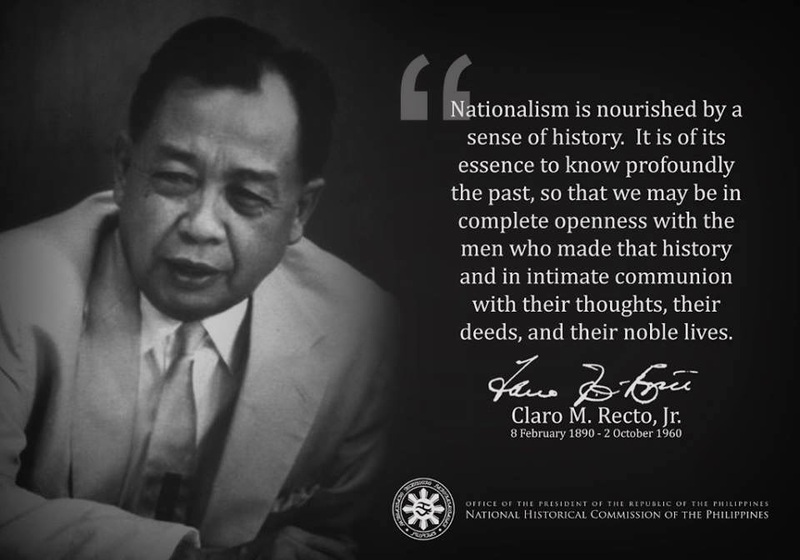 Here's an attempt to identify some of our Filipino characteristics, thus cultural, and other hurdles we Filipinos need to acknowledge and overcome to attain a strong feeling of nationalism, the lack of which is a strong detriment to true Filipino nationhood, to real economic and political democracies. Nationalism is a sine qua non for a people to develop a strong desire and resolve to correct the problems brought about by: governmental/bureaucratic decisions, military, business elites and foreign influences; and to rein in the strong tides of absolute free trade and cultural globalization - -which has brought only more misery and impoverishment to our fellow Filipinos in the Philippines --and act/work towards the attainment of the common good. 1. Tribal Mentality - it seems our deepest loyalty is limited mainly to our immediate and extended family. The extended family is enlarged somehow through a network created by the "kumpare/kumadre system". Although this system was and is entered into for religious reasons during a child's baptism or confirmation, it is also much used for ulterior motives to get or gain socioeconomic and political influences. This tribal and narrow thinking is further applied and exhibited in our loyalty to our hometown, province or region; thus anyone from outside our circle is virtually ignored, treated with suspicion and mistrust, and easy prey to stereotyping. We are prone to be offended more by negative comments to our hometown, province and region than those about our country. This tribal mentality may be explained by our geographical remoteness (coming from various islands), different dialects, historical animosities brought about by the divisive influences made by our foreign occupiers (Spaniards used Filipinos in one province to fight fellow Filipinos in another, or Americans doing same and/or planting Filipino Christians in Filipino Muslim lands), etc. 2. Belief in Determinism and Immature Belief system/Religion - the Spanish religious legacy of Catholicism has inculcated in our minds throughout the generations that whatever happens is seen as the "will of God". Thus, we have developed a fatalistic attitude as expressed in statements such as "bahala na ang Diyos", "ginusto ng Diyos", "oras na", etc. This fatalistic attitude pervades our poor countrymen and even the so-called educated. We are afraid to question such long-held beliefs since we think that it is tantamount to committing sin. We need to outgrow these childish beliefs which are destructive to ourselves and society, and have to learn and understand more deeply our inherited religion and thus develop a more mature Christianity. The aggregate and adverse impact of fatalism is for a populace to throw out their hands in despair, helplessness, inaction and to seek solace in wishful prayers which in effect only gives credence to the oft-quoted remark by Karl Marx that "religion is the opium of the people." 3. Colonial Mentality/English as Medium of Instruction - The almost 400-year Spanish rule did not militate against us in the formation of Filipino nationalism as much as the subsequent 50-year American colonization. The Spaniards for the most part kept the Filipino natives ignorant and uneducated and our revolutionary forefathers fought them effectively and efficiently; actually almost completely defeated them until the Americans came to fool and steal from our forefathers their pursuit of true political independence. After the brutal defeat of our Katipuneros and Filipino nationalists, the American occupying forces outlawed the display of the Filipino flag, banned nationalist publications, incarcerated or deported nationalist writers, and used natives to pursue, fight and subjugate remnant Filipinos who were still fighting the American forces, and label these freedom fighters as "insurgents", "brigands or bandits" (now "terrorists" in current American-driven jargon and as usual copied by the present Arroyo regime ), etc. Under the guise of preparing and teaching us in self-government, the American imposition of public education was designed for the Filipinos to be Americanized in their outlook; and this was greatly attained by the use of English as the only medium of instruction (all part of subtle but extremely effective cultural imperialism). During their 50-year rule, public education was given the greatest priority and was actually run as part of the US Department of the Army to ensure compliance. Thus years thereafter, America was able to leave peacefully since the educational system has guaranteed and continually produced "little brown brothers" who wittingly and unwittingly thought, loyally worked and ruled for America. America did not need anymore to have American occupation troops in the islands! In addition, the practiced "free trade" during the colonial period and its later postwar imposition via our co-opted ruling elites perpetuated American dominance in all significant business and industries; and embedded our taste for imported goods/culture and thus practically killing any nascent native industrialization, keeping us mainly as a source of supply for agricultural products and strategic minerals, and losing our sense of national history, unity and national identity. A critical study of American history will show that the Americans came not to help free the Filipinos from the Spaniards (the revolutionaries have them surrounded until the Americans joined in and fooled them to stay put until their reinforcements arrived). The Americans came because during that moment in time in history, America saw that they need a fueling station for their growing navy, recognized the need to expand their sources of supply for raw materials, and new markets for their excess products.... in Asia, especially the illimitable Chinese market, and saw the Philippines as the gateway for all. Of course, we can not learn these historical truths in Philippine and American schools unless one goes beyond official school textbooks and government publications. 4. Lack of Social Consciousness/ Selfish Individualism - The tribal mentality has resulted in this Filipino character. It is also the product of a mixture of the historical, perennial and current abandonment by the national government, the Filipino rich and powerful. The resultant deprivation has molded us and explains much of our characteristic behaviour of just "looking out for ourselves", i.e. family and extended relatives at best. The fortunate ones who inherited lands and wealth tend to continue their disgust and lack of concern for the poor. The others who gain wealth, through legal and/or illegal means, or have risen above pure subsistence level by merit or emigration similarly take care only of their circle of family, friends and relatives. For example, numerous kababayans who emigrated to America easily co-opted to the American way of insatiable "conspicuous consumption". We were either previously deprived; or knowing nothing better to do or attend to, surround ourselves with material possessions since our consciousness and thinking never rose above "wants", and have practically equated "wants" with "needs". We seem not to know how to spend leisure time than to go shopping or perform some other material pursuits. Our "hierarchy of needs" get stunted at the material level. We are amazed that the more fortunate and truly rich Filipinos do not become as generous to their fellow countrymen as some similarly successful Americans are (here's one quality I admire about Americans). The cliché "the rich only get richer or the poor want to only get rich" rings true. Forget the saying "it is more difficult for a rich man to enter heaven...." Oh well, who believes that crap. 5. Existence of Private/Foreign schools - The existence of the exclusively private and/or foreign schools is a contributory and extreme detriment to Filipino nationalism. The existence creates a divisive effect to national unity and Philippine society. The exclusive, private schools, i.e. Catholic colleges/universities, etc., for the most part create an elitist class devoid of empathy for the impoverished public since the students are essentially insulated from the day-to-day realities of the truly poor. One can feel and see these attitudes and behaviors from a significant number of graduates from these schools. Of course, there are exceptions. The exclusively foreign schools i.e. Chinese, American, Korean, etc. are similarly so, they see native/malayan Filipinos as a different race (which is true of course) and they as a different people. Their loyalty to the Philippines may be questionable or suspect at worst and who knows what they teach their students? We can only hope that the aloofness and racial differences that we witness would disappear. There is a dire and urgent need to improve public schools but this is impossible given the priorities of the government officials, i.e. more money for the military and/or enriching themselves via government coffers rather than more funding for education. 6. Miseducation - The mis-education of Filipinos is not easily fathomed because it was implemented without violence. The free public educational system brought by the American occupiers efficiently and effectively influenced generations of Filipinos to unquestioningly believe, love, adopt and follow America and anything American. We uncritically copy the American way of life, its materialist obsessions, its pop culture, teachings and economic models, its foreign policies, etc. The mis-education made us forget our forefathers and their quest for true nationhood, to attain the objectives of their unfinished revolution. We learned to ignore our ethnic minorities. Remember our honored "American Boy" General/Ambassador Carlos Romulo, labeling the "Negritos" as not Filipinos? We are truly Americanized -if not trying harder than an American!- without being truly Americans (how can we be, when we historically are seen as "niggers" too?). That is why other Asian neighbors, who have maintained their national identity, national pride and culture (I do not mean just their equivalents to our "tinikling" dance), do not respect us. What a shame. Or do we not care about that too? 7. Educational System/Critical Thinking - Our existing educational system overall seems to have failed and continues to fail to develop in us an ability to think critically as applied to socioeconomic and political issues, which in the short and long run define and affect the lives of our people and future generations. Aside from a few schools such as the UP or a few other progressive ones, the graduates lack appreciation of what is described as "liberal education", that is, the humanities or social sciences. We seem to have countless bright minds who turn out to become successful engineers, doctors, lawyers, accountants, etc but ignorant, if not very ignorant, of critical analysis beyond their professional expertise; more specifically to societal analysis. Furthermore, during the Marcos dictatorship --and continued under subsequent regimes-- the IMF/World Bank, using our humongous foreign debt as leverage, dictated how and where the Philippine educational system has to be directed, i.e. serve foreign investor interests. Thus, we see a lot of us quite naive, ignorant and distant about the predicament of the Filipinos in the Philippines. At best, we mouth or think based on what we have heard or seen in the popular media. Or at worst, who cares (the “since I am ok, I do not care if they're not ok” mentality) as I have encountered among some fellow Filipinos. 8. Lack of Common/Foreign Enemy - In the history of nation-states, almost each nation has gained national identity, unification and sovereignty through battles and wars against a foreign enemy. Our Filipino forefathers rose against the Spaniards, our 400-year foreign occupiers. However, their revolution was hijacked by the cunning Americans whom they also fought but failed to defeat. The Americans left us with their local substitutes: mis-educated (highly Americanized) fellow Filipinos, who knowingly or unknowingly, govern, think and work for American interests. Our fathers united against the Japanese invaders during WW2; and then post-war, their politicians came back to remove from elected office the handful of nationalist fellow countrymen who were identified/labeled and saw (thanks to our mis-education by the Americans) as only plain "communists"; never mind their years of suffering and struggles for more humane treatment by their absentee landlords. Fast forward today, we are enjoined to see and label the Filipino rebels as "terrorists", thanks to the recent foreign policy dictates of America. We see our Philippine Constitution and sovereignty ignored and will be seeing more US troops, via the Visiting Forces Agreements (VFA) directly hunting not just the Abu Sayyafs but the MILFs/MNLFs and NPAs anywhere in our homeland soon, and same troops practically immune from local jurisdiction in case of crimes. We do not have an identifiable foreign enemy because our enemy today is not foreigners roaming our homeland typically garbed in combat uniforms. The physical absence of a foreign enemy makes common, nationalist causes difficult. Our difficulties to the attainment of national unity, our past, present and future dangers to nationhood and common good are brought about by our own people in business and government who are serving foreign interests by continually selling out our patrimony, whatever is left of our fully exploited natural resources, and destroying whatever is left of our national agriculture and nascent industry. These foreign and local business partners, with their westernized allies/technocrats in academia and government agencies, essentially imply: Damn the native, malay Filipino majority in the Philippines. We have to maximize profits, maximize our shareholders equity, to hell with Filipino nationalism -which to them is obsolete, a business constraint that need to be demolished and not necessary in these times of globalization via WTO. To the foreign investors/corporations (mainly American, Japanese and European) and their local partners, the bottomline is maximized profitablity through perpetual dominance. Inasmuch as THE ENEMY IS US for allowing such conditions, the task is much, much more difficult, but not insurmountable. And it may be too late for us, for our present generation; but not for our children and their children. Let us think, decide and act now for the common good of our next generations of native, malay Filipinos. That is what Filipino nationalism is all about. Another impediments to Nationalism is Communism. The communist propaganda hides in the banner of nationalism. They brand themselves as simply nationalist. The communist are the root problem of our nations poverty. Poverty can be resolved if there are jobs. How can there be jobs if foreign capitals and investments are afraid of the political stability in Philippines. I'm not saying that communist are the only group to be blame. Also the corrupt government officials whose aims are self centered. So, what exactly are you trying to dredge up here? The links in this email don't open. What does it matter what America thought a hundred years ago, other than the study of history? I am not sure what you are trying to say here, other than the developing country which the US was a century ago was behaving in a manor that countries did at that time in history. Times were brutal. That being said, I live in Heidelberg, Germany. Close to the Jose Rizal monument. Now, there's history! He was a fraternity brother of mine, as well. You want this forwarded, but I don't see the point of what your are trying to accomplish. I will see if my wife can figure it out tomorrow. I appreciate where you are coming from. I have worked with all shades of Americans up and down the Mason-Dixon line. You say you are ONE American who love the Filipino, that's sweet and great! But unfortunately you are only one, not everyone American, not even THE American. It's clear to anyone who reads and understand English. But I am not just one redneck with who loves a Filipina. There is my whole family (tradational redneck family... lots of cousins). My family was very interested that I end up with a "traditional Southern Woman". After years in the Army and a lot of travel, I found that the best "traditional Southern Women" were to be found in the South Pacific. Now, look at the simularities in US Southern Culture and Filipino Southern Culture. You call it Lechon Baboy, we call it a pig pickin. Now, I have been plowing through the Blogs. Believe it or not, there is not much of the historical stuff that I disagree with. History is history and a developing country which the US was a hundred years ago probably had politicians who said the problem with the PI (you probably don't like that term, but I am not a politically correct kind of redneck) was Filipinos. Pretty stupid thing so say, by modern standards. In my wedding in Cebu, a traditional PI wedding, except it was conducted in a Lutheran Church in Cebu (which I used to attend on trips there), we had the usual group of people required to witness a Filipino wedding. One of our sponsors was my wife's favorite professor at AMA Computer University, who was happy for my wife, but had tried to recruit her for his startup software company. He and I had a lengthy conversation. The PI is exporting it's best minds instead of giving them incentive to stay in the PI to build the infrastructure. Nurses are taking jobs as Nannys in Hong Kong. Engineers (My Father in Law did this next one himself) are taking jobs on international ships as stewards....ETC. There is little envestiment in the infrastructure, and that is a huge problem. Yes, at this point in time, I think that the PI should grow up. That is the message I am reading in the Blogs. The PI has certainly earned it. Here is the biggest problem, as I see it. The same old families (about one half of one percent) are still running things in the PI, as they have for centuries. About 10 percent of the population (generous calculation, probably less) are doing their bidding, then there is everyone else. What do you think? Am I right? Do I as an American feel a special friendship with the people of the PI. Sure. We shed blood together, once. That's important to the average American who knows history. Knows that average Filiponos risked life to sneak water to Soldiers (both American and Filipino) on the Bataan death march. Here was a dumb move, though, if you ask me. Pulling those Filipino Soldiers out of Iraq early. Better to have never sent them in the first place. But the message sent to your cousins down south is that there is an easy way to do their bidding in the PI. Simply kidnap to get their way. Sometimes, you cannot blame those Filipinos who prefer to be "Americanize"...in many ways, the American culture is much more practical than the Filipino culture. I'll cite simple examples. In the US, people who eat in fastfood fix their mess after eating. In the Philippines, you just leave it as is. In the US, a fifteen minute walk is short. In the Philippines, it's "nakakatamad". In the US, when they bump into something and it falls down, they pick it up..it the Philippines, they wait for a good-hearted Filipino to put back those things that fell. I'm not saying that being American is better but if we rally want to remove colonial mentality among our people... we should contemplate on our culture ad DO something. or maybe, let's not compare ourselves to the Americans.. let's just do it to the Korean students. If you know the history and nature of world communism, you will know that communism does not welcome nationalism. In theory, communism is internationalist, not nationalist; that is why it's slogan is "workers of all nations, unite!" and its anthem is "L' Internationale." Yes, communism made use of nationalism whenever, as when the USSR was fighting for survival during WW2 and thus, Stalin told his fellow Russians to fight for their "motherland," not for Communism. I think and believe nationalism can make use of communism, since it has a good appeal and good organizational skills. Fast forward to 1989, the Berlin Wall went down and the Soviet Empire followed tumbling down; and you know its ethnic nationalism of its satellite states which brought the empire down. Communism in our homeland did not cause poverty. On the contrary, communism is bred and thrives on poverty. Law and order problems, socio-political instability are products of poverty. Rebellion against the Spaniards, the land-holding friars, then against the mestizo and native aristocracy were occurring BEFORE communism was preached by Marx & Engels, and by Lenin or exported as an ideology to our homeland. Given that out homeland is primarily agricultural, from lack of fairness then and later the lack of agrarian reform made rebellion a continuing feature in our homeland. Remove poverty and communism dies in practice. Look at recent world history around you, i.e. Berlin Wall, USSR and satellites, etc. I don;t know how far you went to school, given your statement about my dredging on "...what does it matter what America thought a hundred years ago, other than the study of history? well, that's the problem with many Americans, if not most. I have lived and worked here for 30+ years and that's what I gather from Americans I socialize, BS and work with, etc. American-authored/published history books and many current books and popular publications as applied to American intervention in and colonization of the Philippines are full of omissions,lies, inaccuracies, etc. These are the reasons I dredge the relevant history. That is why a critical thinker and one who desire correct solutions study history. Bit of good news. In the recent two decades or so that a few American historians are revisiting and questioning old historical assumptions and statements. Now they talk about myths about the likes of Jefferson, Franklin, etc. ; about American Empire, Exceptionalism, Hegemony, etc. Well, I can go on and on, but do not want to be repetitious here. I have covered them all in my blog. And frankly anyway, I do not try to talk out the already convinced, especially any American (or fellow Filipino) who apparently and unquestioningly believes in American exceptionalism.